You are currently browsing the The Pet Product Guru blog archives for the day Saturday, May 12th, 2018. Several times per year, beautiful Golden Retrievers take over the beach in Delaware. The Golden Jubilee is an annual event here in Dewey Beach and Rehoboth Beach. 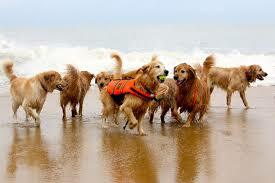 Thousands of Golden Retrievers run, splash and play on the beach with their owners and have a great time. Later in the day, residents meet these great animals as they parade down Rehoboth Ave. in Rehoboth Beach. It’s a wonderful event recognizing how great it is to own a Golden Retriever. Many residents here at the Delaware beaches love their pets and our communities are pet friendly and are very welcoming to our feline and canine friends. Keep in mind that dogs are not allowed on the beach between Memorial Day and Labor Day due to the thousands of tourists that visit the beaches during this time. Rehoboth and Dewey Beaches live, local and reliable oldies station broadcasting around the world on the internet! Edgewater Gold Radio plays a large variety of oldies from the 50s through the 80s plus great standards! Turn us on and make us your go to oldies station! The greatest variety of oldies and standards are on EDGEWATER GOLD RADIO -tune in to our unique blend of great music!